If you are human, you have most likely experienced a nightmare at some point in your life. Nightmares occur most frequently during childhood and for most of us, the occurrence subsides as we grow older. Beyond age 13, girls experience more nightmares than boys, though some people have nightmares well into adulthood. 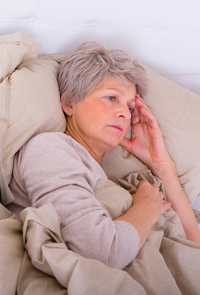 Waking up to terrible, negative thoughts can make sleep and dreaming beyond unpleasant, no matter your age or gender. Often nightmares diminish on their own, rendering treatment unnecessary. Addressing the cause of persistent nightmares, whether it is taking a certain medication or experiencing a lot of stress, can help keep them at bay. If you are troubled by recurring nightmares, Image Rehearsal Therapy is a popular treatment method for nightmares. During this therapy, your nightmare will be given a positive ending upon which you can mediate while awake. This treatment often proves successful in eventually removing the terrible nightmare imagery from your mind. Due to their elusive nature, testing for nightmares is not easily done. If your nightmares are severely disrupting your sleep, your doctor may suggest you undergo a sleep study. This study can uncover the presence of any other sleep disorders, which may illuminate an appropriate treatment plan.